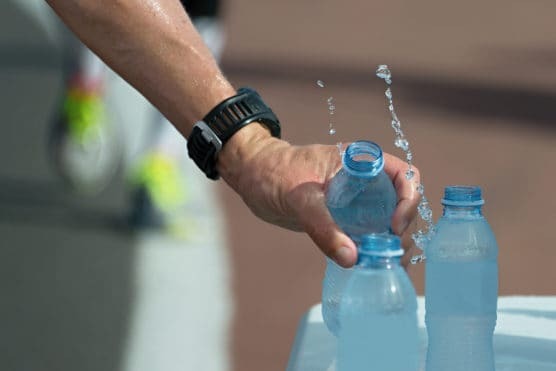 During the summer, proper hydration during workouts is more important. Sometimes you find yourself a few miles into a run and realize you need water immediately. You begin to panic, and every step becomes a challenge. With any run, especially during the summer, it’s important to stay hydrated with both liquids and electrolytes. Did you know by the time you feel thirsty, you are already dehydrated? But how can you stay properly hydrated while running? Probably the easiest and most obvious way is carrying fluids with you. If you bring your liquid with you, you’ll know you will always have them. Water bottles come in all shapes and sizes so find the type that works for you! Handheld water bottles: Most handheld water bottles hold about 20 ounces of water and are molded to the shape of your hand. That way they won’t move around while running. Downside? You cannot hold as much water as other types and sometimes if you are only carrying one, it can throw off your form. Water bottle belt: There are several different shapes and sizes to fit your needs. Generally, belts with water bottle attachments will carry several water bottles and have adjustable straps. Usually, you can store other things too such as gels, an ID or car keys. Plus, you aren’t holding anything so your arms can move normally. The downside? Some runners find belts to be cumbersome or move around while they are running. Hydration vests and backpacks: These are the kings of water bottles. Some hydration vests can hold 2 liters of liquid and keep you hydrated all day long. If you’re looking to keep as much liquid as possible, the vests and backpacks are your ticket. The downside? Running with something on your back is difficult, and you sweat even more. Just think, you are getting an upper body workout too. Bringing fluids with you is the smartest approach. You’ll have access to them whenever you need it. It also means that you don’t hate to limit yourself to water and can bring whatever fluid you like. Maybe you need more electrolytes or salt tabs. The downside to carrying liquid? It’s heavy and harder to run while holding something. Do your research and find something that is comfortable for you! If you don’t like to hold things when you run, it’s best to plan a route with water stops along the way. Most parks have water fountains. A bonus about running through a park is they probably have a bathroom or porta-potty along the way. The downside? The water fountains won’t include electrolytes, but you can always pack a gel or salt tab. It’s also important to make sure the water fountains are turned on! If you want to feel elite with water stashed for you, you can hide fluids along with your route at the location you desire. You won’t have to hold them while running and will have something to look forward to. You can mix your desired beverage and hide it the location or mile marker you think you’ll need. Who doesn’t like a good drink stop? The downside? It’s not guaranteed that someone else might not dispose of your bottles or even worse, drink them! Plus, you’ll have to drive or bike your route to hide the water bottles beforehand. When you are out, it’s important to stay hydrated. Whether it means bringing your fluids with you or stashing them along the way, stay safe out there! Hollie Sick is an avid runner who’s completed more than 30 half marathons. Read her blog, or follow her on Facebook. Missed being able to comment on the survey you had about a month ago. I see I can do so now. You are doing a great job here. All your stories are interesting and fun to read (I really never read much of anything usually, I tend to fall asleep after the first two paragraphs), not in this case though. You really know how to hold ones attention. thank you for the great stories. My wife and I are setting out to get a Half Marathon in each State. Got 8 so far. We use your race calendar to plan each run. Again thanks and keep up the good work !